The Physiotherapy department operates in modern facilities. 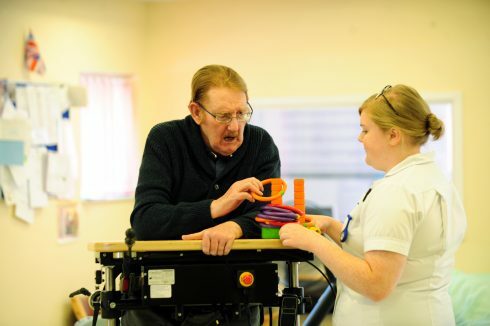 Our experienced, in-house physiotherapists help residents improve their flexibility and lead more active lives. Many of our residents suffer from multiple disabilities affecting their mobility. Physiotherapy is an important part of the rehabilitation package since it supports quality of life and the day-to-day enjoyment of activities so necessary to well-being. Treatment begins with a thorough assessment of a resident’s physical capabilities and mobility problems. From the initial assessment a set of achievable targets are set within a weekly schedule. Rest assured that our residents are involved in this process and are able to voice concerns and opinions regarding their level and style of rehabilitation. To achieve our multidisciplinary aims it is also necessary to involve all professional care departments to ensure that we keep the holistic welfare of our residents paramount. We also keep our residents’ families up to date with any developments and rely on their willingness to work with us and their loved ones in order to maximise recovery potential. Progress throughout the session schedule is recorded and regular assessments take place to resolve and readdress the residents’ needs.